On February 3, 2005, Mattilda, a.k.a. Matt Bernstein Sycamore, spoke at Bookshop Santa Cruz. Mattilda is the editor of a 37 author anthology called,"That’s Revolting! Queer Strategies for Resisting Assimilation." 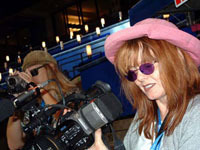 On February 4th at 7:30 P.M. in the Veterans Memorial Building in downtown Santa Cruz (846 Front Street), Penny Little, the producer and director of the movie “Electile Dysfunction�? will be at the Open Voting Consortium’s fundraiser event, camera in hand, to film activists, organizers, and members of the general public about the problems with the voting machines used in the last presidential election and alternative systems that can be adopted in the future. Speaking at the event will be activists Emily Levy, Project Coordinator of the Richard Hayes Philips project which discovered many election anomalies in Ohio, and Maureen Smith, long-time peace and social justice activist. Alan Dechert, president and founder of the Open Voting Consortium, will speak at the event to educate the public about the Consortium’s open voting system. The event will also feature showings of clips from the movies “Votergate�? and Little’s most recent version of her film “Electile Dysfunction,�? 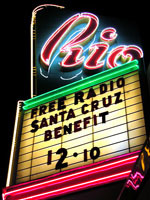 live music from the political rock band Ms. Information and the Santa Cruz Jazz Society, and a dance performance by the Federal Dancing Authority. Activists from as far as San Francisco and Berkeley will be attending the event, including Gary Hewlett, one of the organizers of the Mainstreet Moms Operation Blue (formerly known as Mainstreet Moms Oppose Bush). Upon Entering Special Collections I first focused on "Cactus Forest", an image that brought to mind the openness and depth of Ansel Adams. No Surprise. In the Glass case behind me was a copy of Ansel Adam's "Making a Photograph" from 1935, inscribed by the author to Edward Weston, who wrote the forward. Recording artist and producer Sista Monica Parker is spearheading a community charitable musical event. It’s a Tsunami Disaster Relief Benefit Concert on Sunday, January 23, at 6pm (doors open at 5pm) in Santa Cruz, CA at First Congregational Church. Joining her will be Grammy award nominee Linda Tillery from the Bay Area. Singer Valerie Fiddmont, Watsonville Taiko Drummers, Rev. David Grishaw Jones, Rev. Deborah Johnson, artist Carol Bowie and many other community members all volunteering to “Singing In The Spirit�?. This benefit concert is in support of disaster relief for the victims of the Tsunami/Earthquake. There will be singing, meditation and individual performances to create and unite in the spirit of community and charity. All proceeds go to the victims of the catastrophic earthquake and tsunami via Oxfam International, Save The Children, United Church of Christ and Habitat for Humanity International. Okay, enough hemming and hawing. It's time you sprung into action. Stop yer waitin' and seein'. The world's gonna pass you by and you'll be bummed. Octubre de 1925: los festejos del supuesto bicentenario de la ciudad. Una eficaz operación de construcción de legitimidad de la burguesía rosarina. It's Buy Nothing Day in Santa Cruz and all around the world. In celebration today, go out and enjoy the surf on this stormy day; check out Big Basin State Park; go kayaking in Elkhorn Slough; or, if it's raining, go see the Long Marine Lab. Above all, avoid those bastions of brazen corporate culture cookie-cutting, such as Capitola Mall. IF you do go, however, be sure to let em know that it IS Buy Nothing Day and that they need to be delivered from American Shopping Sleeping Sickness! We come with different but similar hopes - blowing minds, revolution, political involvement, DIY culture, community, self-reliance, great music, bone-shaking percussion, and a rollicking good time.